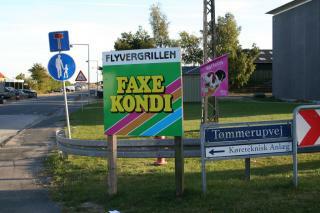 The Flyvergrill (Pilot Grill) at the end of Amager Landevej is neighbour to Copenhagen Aiport. The eatery opened its doors in 1972 as an ice cream wagon. Within a few years, the owners were able to build a takeaway on the site, and in the '80s the building was expanded to its present 30-seat capacity. Some 50 or so model airplanes dangle from the ceiling, and the walls are plastered with pictures of airplanes. Flyvergrill, with its front-row view of the airport runway, is a favourite hangout for airplane buffs. For a change of gear, the back of the restaurant offers a view of a test track for people learning to drive. What’s on the menu? When the current owner took over the restaurant in 1991, she made small, gradual changes, like putting classic dinner favourites on the menu. After starting with minced meat patties with onions and hash with fried eggs, the menu now offers some 90 dishes, from burgers and hot dogs to Danish meatball sandwiches and spring rolls. How big is the staff? During the busy summer months, as many as five people are on hand from morning to evening, and a separate ice cream window is opened. During the winter months, when all but the die-hard plane spotters head home, the Flyvergrill operates with a crew of two.